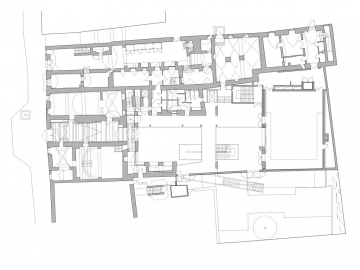 The project is a reactivation of three Renaissance houses in the historic core of the Styrian town Bad Radkersburg. The existing structure has been expanded into a culture, event and seminar centre. The project is a reactivation of three Renaissance houses in the historic core of the Styrian town Bad Radkersburg. 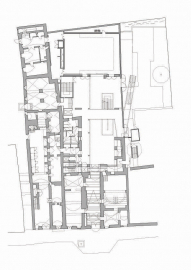 The existing structure has been expanded into a culture, event and seminar centre. 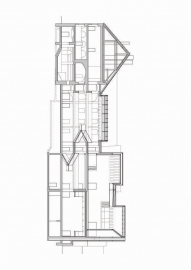 The important questions concerning the insertion of a new volume into the historic surroundings were the scale, the texture, and the functional context. 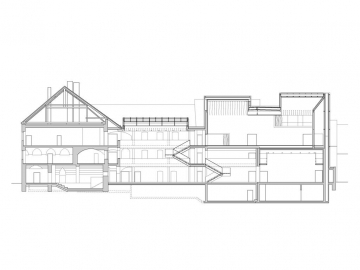 The thoroughly-shaped silhouette of the new building reflects the towns grown roof-scape. 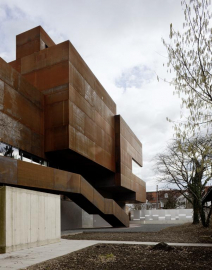 All over clad in Corten  a material suitable for a historic site since its patina harmonises with the brickwork of the old roofs the new building blends into the existing fabric. In addition to topics regarding energy and production technology, the use of existing building structures is one of the most essential topics in sustainable architecture. New interpretation of the existing and a thematical modernisation are at the focus of our reflections in building projects that involve a historical background. The implementation of a cultural centre in the historical and largely protected city centre of Bad Radkersburg serves as the built example of these considerations. 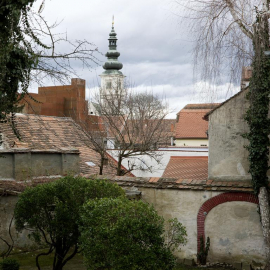 The town largely owes its business potential to a thermal spring, which was discovered in the 1970s and led to an abundance of spas and hotels in the towns suburbs, albeit failing to bring business into the historic centre. The idea was to change this through the impetus of the new cultural centre in the old town and against all odds and resisting the obvious position at the spa area in the towns suburbs, the decision was made to place this centre in three listed buildings on the main square. 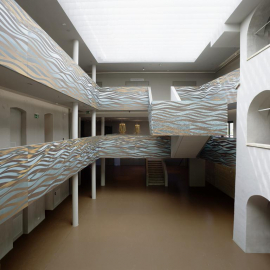 With this decision came the challenge of the spatial programme: not one single large, multifunctional hall but rather several rooms of different sizes, different atmospheres, offering different possibilities of use, were adapted and placed in the existing structures. Depending on requirements, these rooms can now be used individually or combined or even as the entire cultural centre. The inner courtyard, sheltered with a glass roof with textile canopies, was adapted to a foyer. From here all rooms and halls are accessible. 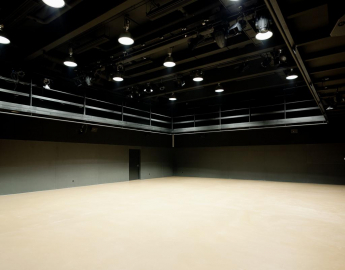 A highly insulated blackbox, accessible via the ground floor with space for approximately 250 people, is used mainly for electronic music, film or theatre events. The concert hall above, for 400 people, with its timber cladding painted in different shades of white, is particularly apt for chamber music and selective openings offer particular views. Its height development follows acoustic and lighting considerations on the one hand whilst, on the other hand, it refers to the small-scale roof structure of neighbouring buildings. This central design measure is completed by the decision to clad the multifariously differentiated building body with Corten steel. 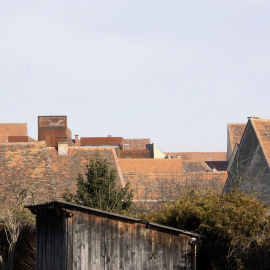 Through the process of aging it will develop an appearance similar to the tiled roofs nearby; thus this material offers correspondence without shying from the obligation to deliver contemporary architecture. Inside the building the light is soft, lending a velvety aspect to surfaces. 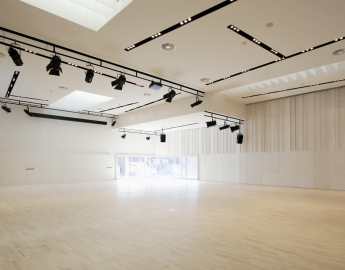 In addition to the large halls which were designed in contrasting white and black, a large number of smaller event rooms clearly differ in their atmospheres. Public access and gathering zones reflect grey and terracotta shades from the old town centre. The banister motifs developed by Bohatsch Visual Communication refer to the importance of the river Mur for the towns history. There was a conscious decision not to install catering services in the centre itself. Both the main square and Frauenplatz square to the east are conceived as an extended foyer and offer the corresponding infrastructure, this again will help to promote businesses in the old city of Bad Radkersburg.